The Piratess Tilly Book Launch and Cure SPG47 Fundraiser on Saturday, May 13th, 2017 was a beautiful success. The location could not have been more appropriate than in the “Hall of Ships” at the Custom House Maritime Museum in Newburyport, a room in which a painting of ship Tennyson hangs proudly. For it is this ship that a woman – Mary Newton Lunt Graves – in 1860 took control and safely brought it to port when her husband, Captain Alexander Graves, became disabled. How could we not launch Piratess Tilly’s second girl-empowering sea adventure in this maritime museum with such inspiring historical stories! 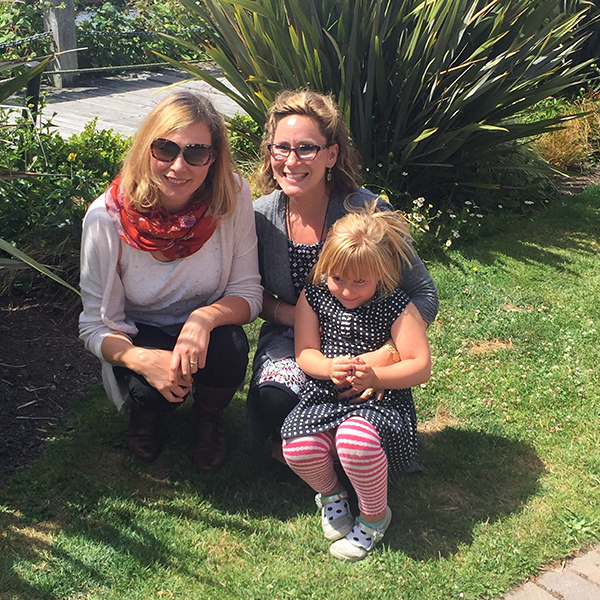 Author Elizabeth Lorayne with Kasey Edwards, co-founder of Cure SPG47 and her daughter, Robbie. The Custom House Maritime Museum itself was so generous with their support that admission was free for the length of the event! Guests got to not only get their books signed, work on a book related craft (coloring pages and a paper hang glider), grab an organic lollipop, watch the slide show of the book itself, and browse the overflowing totes for the raffle, but they also got the chance to peruse the museum and soak in a dose of history. I would like to take a moment to thank Newburyport Montessori School because it was there that I first met Kasey Edwards and her two children, Davis and Robbie. Kasey is the kind of person who radiates love, patience, strength, and perseverance. I am in awe of her grace and determination. I encourage you to follow their story on Curespg47.org and on their Facebook page. Their fundraising journey to study and, hopefully, find a cure for hereditary spastic paraplegia, type 47 has just started and I am thrilled to be writing them a check that includes nearly 100 book sale proceeds and raffle ticket sales of $1,858. Siga Snipas and Gretchen Stone of Bean Group will be writing them their own checks ($5/book sold at the event) for a grand total of $2,233! No doubt Piratess Tilly and koala Yuki are just as proud! When I first had the idea exactly 2 months prior, I had no idea how generous and encouraging Newburyport shops, businesses, and friends would be in supporting the book launch and Cure SPG47 fundraiser. From newburyport.com sharing the story, to a childhood best friend flying from Seattle, to Siga Snipas and Gretchen Stone of Bean Group jointly pledging $5 per book sold, I feel truly fortunate and grateful – it was a magical morning and experience. As a keepsake for those who attended the event and even for those supported Cure SPG47 through online book sales that week, people received a double-sided bookmark featuring the businesses that contributed and a red ribbon tassel. From the moment the party started until shortly after the raffle drawing, there was a wonderful and continuous line of families wanting books and raffle tickets, but one family I will always remember, for they are related to another child in Seattle who also has hereditary spastic paraplegia, type 47. Signing the Piratess Tilly books in her honor was truly special. Robbie Edwards drawing 1 of the 3 winning raffles! As a child, I had watched my mother organize rather grand fundraisers. It was particularly meaningful for me to have my own young daughter see the work and passion it takes, no matter the scale, to orchestrate a successful fundraising event. And I couldn’t think of a better way to include the children related to myself and the Edwards family than by having them draw the winning raffle tickets! April's Family Fun Days sail into the Custom House Maritime Museum next week, along with a special appearance by Piratess Tilly, the heroine of two critically acclaimed books by local author and Newburyport mom Elizabeth Lorayne. We caught up with Elizabeth to find out more about the book series and its focus on a smart, strong female character who loves science and exploration. Newburyport Macaroni Kid: Many children's-book authors are inspired to write because they perceive a gap in representation for a certain kind of kid. Did you feel that there was something missing from bookshelves? Elizabeth Lorayne: When I first felt inspired to create the character of Piratess Tilly, I had observed a huge gap on the bookshelves. I saw far too few picture books with strong, intelligent, compassionate, relatable (to me), adventuresome heroines, let alone ones interested in science and history. And I therefore wanted more for my own daughter and for myself – I even wanted to see someone who represented pieces of myself as a child because I imagined I wasn't the only one who was was curious about nature. Or who cared about saving the animals and the planet. Or who was a leader. Or who loved being outside – on the water sailing. Continue reading the full interview here! A small contribution to the upcoming worldwide March for Science. MAC: PRESS "CONTROL" AND CLICK ON IMAGE TO "SAVE AS" | PC: RIGHT CLICK TO "SAVE AS"
Piratess Tilly is passionate about nature, science, exploration, and helping others. Feel free to download this 8.5" x 11" poster and share the link with your friends! Also, please be sure to sign up for the newsletter below to get the latest information on Piratess Tilly events, announcements and developments on The Historical Heroines Coloring Book: Pioneering Women in Science from the 18th and 19th Centuries – a new project successfully funded on Kickstarter. Sign up with your email address to receive Piratess Tilly and Historical Heroines news and updates. Shop is now Open & Save the Date! Thrilled to announce that you can now get your copy of The Adventures of Piratess Tilly: Easter Island! Plus, Save the Date! Plans have been made for The Adventures of Piratess Tilly: Easter Island book launch party! It'll be held at the Custom House Maritime Museum in Newburyport, May 13th from 10-12pm! And because Piratess Tilly is passionate about raising awareness and helping those in need: All proceeds from book sales will be donated to Cure SPG47 to help a Newburyport friend's young daughter with research for her genetic disease! We're working on making it a bigger fundraiser with some possible raffles as well – Please save the date! I couldn’t think of a more meaningful day to launch my very first KickStarter for my newest project – The Historical Heroines Coloring Book: Pioneering Women in Science from the 18th and 19th Centuries than yesterday – the first day of Women’s History Month! I can’t seem to shake this desire to work towards inspiring children, teens, and adults – and so I continue to create empowering and educational books. The idea behind this particular coloring book is a bit more unique in that each woman scientist will be featured as a double page spread. On the lefthand side I will provide a short biography and on the righthand side, the coloring image itself, drawn by Kendra Shedenhelm. Each coloring illustration will incorporate some of what that woman scientist accomplished. Michael Barton, a science historian, who helped write the biography on Charles Darwin for my Piratess Tilly children’s picture books will be assisting me with research and editing. I am really excited about this project and hope you feel the same. If so, please consider both sharing the project with your friends and family as well as contributing to the campaign by pre-ordering the book at a discounted rate and therefore becoming an official backer! Sign up with your email address to receive news and updates about Piratess Tilly and The Historical Heroines Coloring Book! P.S. My daughter Vivi helped with the video and I couldn’t be prouder! Check out the campaign here! Thank you!! In the upcoming March/April Issue of Foreword Reviews Magazine, their editorial review of The Adventures of Piratess Tilly: Easter Island will be showcased in the Children's Book Featured section! I am proud to share that The Adventures of Piratess Tilly: Easter Island Kirkus review was selected as 1 of 35 indie reviews to be featured in the February 1, 2017 edition of Kirkus Reviews printed Magazine. You can see the review on page 182 or read it below. It is such an honor to now have been selected for both Piratess Tilly books! If you are a book shop or library and are interested in procuring copies, please subscribe for updates below or check back here (PiratessTilly.com) the first week of March when both the 2nd edition of The Adventures of Piratess Tilly (now including biographies on the historical figures Charles Darwin and Beatrix Potter as well as a glossary) and its sequel, The Adventures of Piratess Tilly: Easter Island will be available! Thank you again for all of the support! "In this second installment of an ecologically based adventure series for children, a young naturalist and ship’s captain sails to a remote island and discovers a threat to the local wildlife. Piratess Tilly—the refreshingly bold, smart heroine introduced in Lorayne’s debut picture book (The Adventures of Piratess Tilly, 2016), illustrated by Watson—takes to the sea again on her research ship, the Foster. She’s accompanied by her friend Yuki (a rescued koala bear) and the seven orphan boys who make up her diverse crew. Their destination: Easter Island. Unfolding in graceful haiku, the tale follows passionate naturalist Tilly (“An explorer’s dress / Patch pockets for her notebooks / Trade tools in her bag”) as she studies the mysterious Moai statues and scuba dives to observe marine life native to the area, sketching and cataloging what she sees. The trip takes an unexpected turn when the crew encounters pirates raiding the nests of sooty terns in an egg-smuggling venture, and the group launches a successful rescue effort, led by parasailing Tilly and Yuki. (In the first Tilly adventure, a trip to the Galápagos Islands became a mission to save baby giant tortoises from the clutches of another band of pirates.) Lorayne’s poetic text is fully integrated into Watson’s lovely watercolor images, executed with an eye for captivating detail. The tale delivers enough escapades and suspense to satisfy a young audience, but the author also includes ample learning opportunities to encourage children to seek out the story’s substantial real-life underpinnings. These include examples of sailors’ knots, a glossary of words and terms—endemic, expeditions, trade winds, thermals, etc.—and various fish species skillfully rendered by Watson. In addition, the volume features short biographies of Tilly’s 19th- and 20th-century inspirations, Charles Darwin (“Darwin on her shelves / Evokes her scholarly dreams / Coral reefs and fish”) and anthropologist Katherine Routledge, written by science historian Michael Barton and archaeologist Jo Anne Van Tilburg. Sign up with your email address to receive Piratess Tilly news and updates. In the spirit of holiday giving, I'm offering my ebook for free! In this picture book, written in haiku, an adventurous girl and her crew of orphaned boys sail the high seas and intercept a band of pirates kidnapping tortoises on the Galapagos Islands! Wow! The first industry review is in for the upcoming sequel, The Adventures of Piratess Tilly Easter Island (February 2017, White Wave Press). I am incredibly grateful that the reviewer at Kirkus Reviews both recognized and appreciated the story development and the educational additions (glossary and short bios on Tilly's historical heroes). Onward we go! In this second installment of an ecologically based adventure series for children, a young naturalist and ship’s captain sails to a remote island and discovers a threat to the local wildlife. Piratess Tilly—the refreshingly bold, smart heroine introduced in Lorayne’s debut picture book (The Adventures of Piratess Tilly, 2016), illustrated by Watson—takes to the sea again on her research ship, the Foster. She’s accompanied by her friend Yuki (a rescued koala bear) and the seven orphan boys who make up her diverse crew. Their destination: Easter Island. Unfolding in graceful haiku, the tale follows passionate naturalist Tilly (“An explorer’s dress / Patch pockets for her notebooks / Trade tools in her bag”) as she studies the mysterious Moai statues and scuba dives to observe marine life native to the area, sketching and cataloging what she sees. The trip takes an unexpected turn when the crew encounters pirates raiding the nests of sooty terns in an egg-smuggling venture, and the group launches a successful rescue effort, led by parasailing Tilly and Yuki. (In the first Tilly adventure, a trip to the Galapagos Islands became a mission to save baby giant tortoises from the clutches of another band of pirates.) Lorayne’s poetic text is fully integrated into Watson’s lovely watercolor images, executed with an eye for captivating detail. The tale delivers enough escapades and suspense to satisfy a young audience, but the author also includes ample learning opportunities to encourage children to seek out the story’s substantial real-life underpinnings. These include examples of sailors’ knots, a glossary of words and terms—endemic, expeditions, trade winds, thermals, etc.—and various fish species skillfully rendered by Watson. In addition, the volume features short biographies of Tilly’s 19th- and 20th-century inspirations, Charles Darwin (“Darwin on her shelves / Evokes her scholarly dreams / Coral reefs and fish”) and anthropologist Katherine Routledge, written by science historian Michael Barton and archaeologist Jo Anne Van Tilburg. An eye-pleasing picture book that offers a winning mix of adventure, science, and poetry, with a strong heroine who invites readers to view the world as a place of natural wonder. Piratess Tilly Easter Island Trailer! My colleague Maria Kamoulakou of Sky Cloud City and I am looking forward to meeting families and other local authors at the 2nd annual Children's Author Festival at the Strawbery Banke Museum in Portsmouth, NH on Saturday 11/5 from 11am-3pm. I hope to see you there! How wonderfully surprised was I to open my mailbox and discover this handmade quilted postcard featuring Easter Island! The postcard was a thank you from a friend and I will cherish it forever. Update: The Adventures of Piratess Tilly Easter Island! The months of research and writing; illustration and painting; and now book design are all finished for the sequel -- due out January 2017! More updates to come, but I am feeling immensely proud of this book and cannot wait to share it with all of you! Happy 150th Birthday to Beatrix Potter: conservationist, scientist, artist, author and businesswoman! Today is Beatrix Potter's 150th birthday! And what a day it is in England, with celebrations, an auction selling some of her original works and a series of Royal Mail stamps depicting several of her famous characters. Some of what inspired me to include Beatrix Potter as one of Piratess Tilly's heroes is Potter's dedication to land conservationism. With the money she made from her books, she bought the adjoining lands and farms in the Lake District of England in order to save and protect them — eventually donating 4,000 acres of land and 15 farms to the National Trust. Beatrix Potter was also passionate about botany and specifically the study of fungi — a scientist in her own right, she developed her own theory on how fungi spores reproduced. Her scientific paper was never properly published, but scientists today still recognize her contribution to mycology. Potter was also not only a talented artist and writer, but she was a keen businesswoman — creating and licensing the first ever literary character doll and other accompanying accessories. And, as so many know, she published her first book, The Tales of Peter Rabbit, on her own — a self-publisher! I look forward to one day visiting the Lake District and seeing for myself the beauty that inspired such a phenomenal, adventurous woman. And as The Adventures of Piratess Tilly is a children's picture book, I'd like to take a moment to share two children's picture books that my little one and I enjoy about Beatrix Potter: Beatrix Potter and Her Paint Box by David McPhail and Beatrix Potter by Alexandra Wallner. I have also ordered this newly released book: Beatrix Potter and the Unfortunate Tale of a Borrowed Guinea Pig, written by Deborah Hopkinson and illustrated by Charlotte Voake. I look forward to adding it to our collection! Learn more about Beatrix Potter here! Event 8/6/16: Yankee Homecoming's Inn Street Artisans Revival! After the amazing experience I had sharing The Adventures of Piratess Tilly with families over Memorial Day Weekend at the Newburyport Custom House Maritime Museum's Maritime Days, I eagerly signed up for another local festival. I will be selling books and dolls while also passing out complimentary "color-me" postcards on Saturday August 6th from 10am - 5pm on Inn Street in Newburyport, MA at the Inn Street Artisans Revival! The Inn Street Artisans Revival is a new addition to the week long Yankee Homecoming festival July 30 - August 7th in downtown Newburyport that celebrates our long history. I encourage you to read more about the festival here. This new event will primarily be featuring local artists. I hope to see you there! It is a powerful and meaningful moment to share aspects of your childhood experience with your own 4 year old daughter and husband. We recently traveled to Seattle, WA, journeyed up north to the San Juan Islands and further still to Victoria, B.C. I hadn't spent any decent amount of time in those areas in over 10 years, long before the birth of Piratess Tilly. It was both exciting and overwhelming to witness and explore hand-in-hand with my daughter the very same docks, shorelines and boats that I had as a child. It quickly became clear how deeply rooted those formative experiences are in my psyche -- there is no doubt that Piratess Tilly was inspired by my own childhood adventures! To top off this meaningful trip, I finally got to meet Karen Watson, the extremely talented artist behind the watercolors to Piratess Tilly. It was like meeting an old friend! We both laughed at how incredible it is that we've created two picture books without ever meeting in person or even talking on the phone -- it has been all done through email! I cannot help but feel that it is particularly special and synchronistic that we are both from the Pacific Northwest. There is no doubt, in my mind, that this has greatly influenced our bond and our work together on the Piratess Tilly series. I feel very fortunate to have shared all of this (plus so much more in Seattle itself!) with my family and to have finally met Karen Watson -- what a remarkable summer this has been! Somehow between the end of the school year and the beginning of summer, the last few weeks have flown by! I am most excited to finally share the wonderful reception The Adventures of Piratess Tilly had at the Newburyport Maritime Days event over Memorial Day weekend. I first want to say 'wow!' The entire week that the 16th Century Spanish tall ship, El Galeón was here in Newburyport was not just exciting for our city, but it ended up being an incredibly magical experience for me. Through the Custom House Maritime Museum, I had the opportunity to meet with the captain of the ship - the only female captain of a tall ship in the world! I presented Captain Rosario Fernandez Rodriguez with a copy of The Adventures of Piratess Tilly and from that moment, time melted away as we spoke for over two hours. I've written an article about this interview and you can read about it here. With that experience of meeting Captain Rosario Fernandez Rodriguez coupled with the backdrop of a tall ship in our port, I went into the 3-day event beaming - and I couldn't be more thrilled with how it unfolded! Although the weather was rather finicky, one day being 90 degrees and the next being cold and windy, the overall reception was incredible. People whole-heartedly loved the entire concept of Piratess Tilly - the haiku, the art, the girl-empowerment, the conservationism. They loved the dolls and the blank greeting cards - all of the add-ons I've created. And lastly, but in no small way, they seemed to love meeting me - the author and publisher. I always offered to sign the book and the look of excitement the children got was not just meaningful - it was magical. I started prepping for this 3 day event a few weeks before. As it was my first outdoor event, I was starting from scratch. I bought an E-Z UP Envoy Instant Shelter Canopy and it truly was easy to set-up. I scouted Marshalls for baskets to hold the books and plushies, picture frames for prices, industry reviews and awards, and a tray to hold the blank greeting cards I ordered from Moo that featured Karen Watson's artwork from the book. The second line of business was all of the signage and extra add-ons. I used one of the images from the book to create a tapestry through Society6. The tapestry made a perfect, eye-catching table cloth! I designed a 2.5'x4' banner through VistaPrint and kept my fingers crossed I'd be able to easily hang it up. ;) I then employed Kendra Shedenhelm to create a coloring poster with her doll and tool illustrations, with the idea that kids would stop and color it on their way to the ship. Inspired by the poster design, I created coloring postcards to hand out to kids who stopped by my table. Although the coloring poster didn't work out, the postcards did! One side featured either Piratess Tilly or Yuki, while the other was a collage of her tools. I ran out of the 100 postcards by the middle of day 2 so started to pass out Piratess Tilly and Yuki stickers instead. Just a few days before the event, I felt inspired to create a small, double-sided card to enclose with each purchase. One side featured the Australian Koala Foundation, of which a portion of sales go towards, and the other had a condensed definition of a "Piratess." These I printed myself on my laser printer and cut by hand. I also had information displayed about the other artists and crafters who have helped to create the Piratess Tilly and Yuki plushies and the custom-made Piratess Tilly rag doll by Phoebe&Egg. A special thank you to Gretchen Joy for her work as local seamstress and a big thank you to Kendra Shedenhelm who worked with me for a year to design the plushies! Thank you to everyone who came out and stopped by the Piratess Tilly tent! It won't be our last event, that is for sure. So please, stay tuned! May 27, 2016 Interview with Captain Rosario Fernandez Rodriguez of tall ship El Galeón docked in Newburyport, MA written by Elizabeth Lorayne. There was magic in the air that morning of Friday, May 27th. Not only was the 16th century Spanish tall ship replica, El Galeón, in Newburyport’s harbor, but I was scheduled to meet the captain, the only female captain of a tall ship in the world. The synchronicity of this opportunity left me feeling giddy as I walked the enlivened streets of Newburyport to the ship. This special meeting was arranged by the Newburyport Custom House Maritime Museum because of my children’s picture book, The Adventures of Piratess Tilly. Piratess Tilly is the captain of her own ship and leads her crew on naturalist expeditions. It felt all too pertinent that I give a copy of the book to a real female captain. Boarding El Galeón, walking topside, past the hundreds of salt water infused lines, and simultaneously ducking while stepping over the lip of the doorway; immediately sent me back to my formative years sailing and boating 60 miles northeast of Seattle, WA in the San Juan Islands. Upon meeting Captain Rosario Fernandez Rodriguez, I immediately felt a kinship, while her gracious confidence reminded me of my task at hand. Once seated on the wooden benches in the galley, I presented her with my book. Her eyes lit up at the cover showing young Piratess Tilly at the helm of her own tall ship. Rosario immediately related to the many purposes of the book. She loved the poetry and the art, but mostly she loved the girl-empowerment and the educational features of Piratess Tilly and her crew’s life aboard the ship. Tucked inside the book I had a few questions I hoped Rosario would be willing to answer. Little did I know we would speak for the next two hours, discussing her own childhood sailing and some of her experiences becoming a female captain. Was there a specific moment from your childhood that contributed directly to your desire to work on and eventually captain a tall ship? From that formative moment she seized the opportunity to sail her father’s friends windsurfing board. She didn’t know how to sail, but she persevered and managed to sail across the lake. When she reached the other side, she didn’t know how to return against the wind, so she paddled atop the board! From that moment she knew she needed to learn how to sail properly. Her father took his own passion for sailing and worked to build a sailing club, the Arcos Sailing Club. Rosario explained that because Arcos de la Frontera is 70 miles from the coast, it took some time to show the local community and councilmen the advantages of sailing as a sport. Her father was determined and after receiving several donated 420 sailboats from clubs on the coast, his own sailing club took flight. Pride overfilled her eyes as she told me about the hours she spent helping him repair the boats in preparation for their club. A few years later, when she was 13, in conjunction with a club on the coast, they were ready to offer sailing lessons. Rosario quickly decided she wanted to become a certified sailing instructor, which she accomplished a few years later. When did you decide to become a captain? “wanted to have my own ship, I want to charter my own ship, I want to become a captain of my ship, but I didn’t think of being a captain of a tall ship at that moment,” laughing with amusement at the major role she eventually attained. What are your favorite aspects to both working on and captaining a tall ship? What would you say to young girls who have big dreams and goals? Elizabeth Lorayne is the author of the award-winning children’s picture book, The Adventures of Piratess Tilly. A native Seattleite and the granddaughter of Admiral Walter T. Griffith, she feels most at home near water, which makes living in Newburyport, MA most appropriate. She is an artist and writer, who enjoys hiking and creating art with her family. You can contact her by email ElizabethLorayne@gmail.com or through her books website PiratessTilly.com The sequel to The Adventures of Piratess Tilly, taking place on Easter Island, is due out this October. Come join Elizabeth Lorayne this Memorial Day weekend in Newburyport, MA at her booth exhibiting The Adventures of Piratess Tilly books, handmade plushies & peg dolls and more! White Wave Press is one of 50 local artisans and vendors featured in The Newburyport Collection on the Custom House Waterfront Lawn in downtown Newburyport. This portion of the festival is open Saturday through Monday 9am to 5pm. It is a part of the week long Newburyport Maritime Days, a celebration of visiting Spanish Tall Ship, El Galeón! For more information on all of the awesome events and for tickets to take a tour of the 17th century replica Tall Ship, El Galeón please visit here. I hope to see you this weekend!